PESHAWAR, Jan 4 2012 (IPS) - Suicide bombing is down, bomb attacks are fewer, but the Taliban are keeping up attacks on girls’ schools. In retaliation, a growing number of girls are going for school education – without school buildings. Children come back to a school destroyed in Bajuar Agency in the Federally Administered Tribal Areas (FATA) region in northern Pakistan. Credit: Ashfaq Yusufzai/IPS. 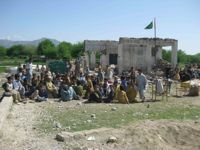 The Higher Secondary School at Kumbar (in the Khyber Pakhtunkhwa area of northern Pakistan) is one such school that has yet to be repaired after it was damaged heavily in a bomb explosion in May 2009. The good news is that the girls pursue their studies without the school building. “The Taliban have deep enmity with education because suicide and bomb attacks have stopped. Over the past one month, the law and order situation has showed signs of improvement, but attacks on schools continue, “says Pervaiz Khan, education officer in Charsadda district of the Khyber Pakhtunkhwa area. Two schools were blown up here on Dec. 21. "We Ask Taliban To Spare Our Schools"
In the past one month, 13 schools in Mohmand, Khyber and Orakzai Agency of the Federally Administered Tribal Areas (FATA) and in Mardan, Charsadda and Peshawar have been dynamited. School principal Ayesha Bibi says the students are still gripped by fear. “The Taliban’s campaign against schools has left about 3,000 students without education. The government has provided 20 tents to provide education to those students,” she tells IPS. The Taliban say they are targeting a certain kind of education. “We are not against education, but these schools are the source of modern and liberal education which Islam doesn’t allow,” Ihsanullah Ihsan, spokesman for the outlawed Tehreek Taliban tells IPS over telephone from an undisclosed location. Ihsan says the Taliban will continue to blow up schools. Pervez Khan, assistant director for education in Khyber Pakhtunkhwa says that 755 schools have been destroyed in the province and 296 in the adjacent FATA. On Nov. 22, the Taliban planted a bomb outside the Government Girls High School in Shah Dand Mardan. The bomb went off while the police were trying to defuse it. “Had it exploded a bit later, it would have killed dozens of arriving students,” says Khan. Several students tell IPS of their determination to carry on. “If we stop coming to school it would fulfill the long-cherished dream of the Taliban,” says Kausar Bibi (16) from the Government High School on Mardan. The girl students of another eight-room school destroyed by militants in January this year in Khyber Agency are upbeat. “Our school is without ceiling, furniture and other educational facilities, but still we are pursuing education,” says Gul Ghutai (9), a third grader in the school. Students at the Government Girls’ High School in Domail in Bannu district in FATA are unsure when the authorities will begin reconstruction at their school damaged in September last year. “More than 800 girls are studying in the school on mats which the students have bought from home,” says Zar Pari, a teacher at the school. “It is difficult for us to listen properly to our teacher due to crowded class, and it is hard to sit in class in the summer, but there is no other way,” says student Mushtari Begum. Khyber Pakhtunkhwa education minister Sardar Hussain Babak says several donor organisations have pledged financial assistance for reconstruction. “We have started reconstruction of 127 schools in Swat where militants destroyed a total of 255 schools between 2007 and 2009,” he says. The government has meanwhile set up village committees to safeguard schools. Not all students get even minimal education. Saeeda Bibi, a seventh class student in Lakki Marwat in Khyber Pakhtunkhwa says that like about 200 students there she does not go to school because the building was blown up in May this year.